Founded in 2001, Nanjing-based Landsea Group (http://en.landsea.cn/) is one of the Top 100 Real Estate Corporations in China and a leader in green tech property development. The company has developed more than 50 real estate projects in several major Chinese cities, such as Nanjing, Shanghai, Hangzhou, Suzhou, Wuhan, Chengdu, Wuxi, Changzhou, Shaoxing, Zhangjiangang, Hefei, etc. Outside of mainland China, Landsea has built properties in multiple internationally, including Hong Kong, Germany, and the U.S. In 2016, Landsea Group joined a group composed of several major city governments, financial experts, and real estate developers to participate in a government-led campaign to develop the rental housing market in China. Since its start, Landsea has focused on developing “green residencies” that are environmentally conscious, energy-efficient, and green-friendly. Landsea Apartments, a segment of the Landsea Group, has become a leading apartment rental company with a mission to provide a thriving, working community for young professionals. By relying on a standardized apartment reconstruction process and high-quality operations management, and focusing on great amenities and features, Landsea Apartments has been able to offer tenants a comfortable living space and affordable housekeeping services (where tenants can request for a cleaning or laundry service). The apartment rental business involves many departments and key touchpoints, from initial property acquisition to lease management to community services. Landsea Apartments wanted to create an online marketing and management platform to better manage internal processes, such as property location selection, property reconstruction, property leasing, community services, staff training, etc., all the while giving tenants a better way to connect with their landlord and manage their lease. Website: Landsea wanted a public-facing site targeting the end users (prospective and current tenants) where visitors could search and browse apartments, make a reservation to tour an apartment, book and sign a lease, view lease information from a personalized user account, and pay rent online. WeChat Official Account Integration: The WeChat official account would allow prospective tenants search and browse apartment listings, reserve an apartment tour, and sign leases. Current tenants would use WeChat to manage their lease, take advantage of housekeeping services (e.g. laundry, house cleaning, etc. ), and pay rent. Landsea staff would also utilize the app to manage apartment reconstruction statuses and update them in real time. 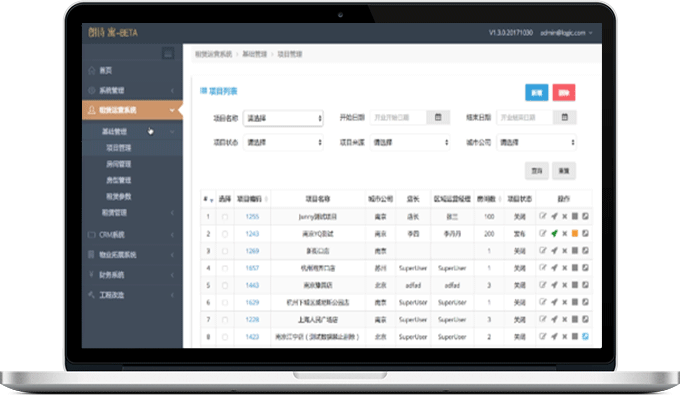 Backend System: This backend system would power both the website and WeChat official account with up-to-date property and lease information. Landsea wanted this to also include CRM and financial accounting features. 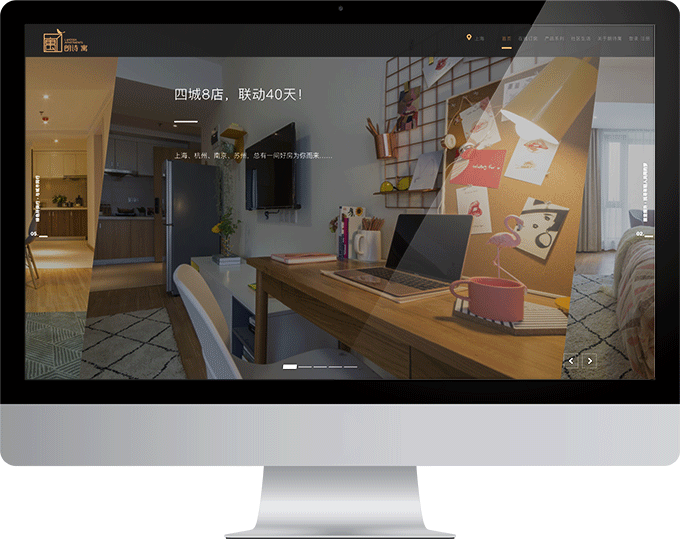 Landsea Apartments approached Logic Solutions for our 20+ year expertise in developing robust web, mobile, and eCommerce solutions, and 10+ year experience in creating transformative enterprise, Internet of Things (IoT), Online-to-Offline (O2O), and mCommerce solutions for the China market. 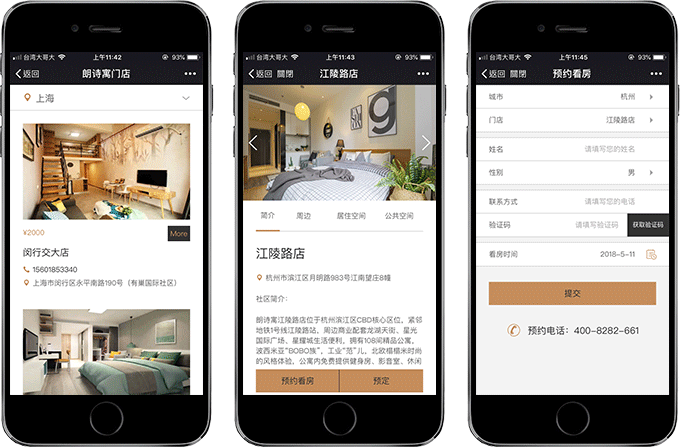 Logic had previously assisted Harbour Apartments, another Chinese leasing company, develop a website and WeChat-based app for their own leasing needs. This prior experience meant Logic was already very familiar with Landsea’s needs and requirements and was confident in our ability to deliver a great solution. Landsea Apartments’ website (http://www.langshiyu.com) is a beautiful, custom-built HTML public-facing site that draws in visitors with its modern design, efficient use of white space, large lifestyle images, and intuitive navigation. In the Apartment Showroom part of the site, the professionally-photographed images of apartment units and rooms entice visitors to learn more about living in a Landsea apartment, book an appointment for an apartment showing, and even sign a lease. The site is also responsive, allowing mobile users to still view beautiful images of the apartment, intuitively browse the list of available apartments, quickly find important apartment information (from rent costs, features, amenities, and more), and easily navigate through the various pages on the site. For those unfamiliar, WeChat (微信 in Chinese) is the mobile messaging and payment app made that has over 900 million monthly active users. Along with its basic messaging and communication features, WeChat users can also use the app to hail a taxi, order food delivery, buy movie tickets, play casual games, access fitness tracker data, send money to friends, pay utility bills, manage finances, buy real estate, and more. WeChat also has millions of “official accounts” on the platform – including brands, celebrities, companies, and even personal blogs – that utilize WeChat’s exclusive APIs for payments, location, direct messages, voice messages, and more to connect with end users. This “app-within-an-app” model allows WeChat to dominate and integrate with almost every aspect of daily life. 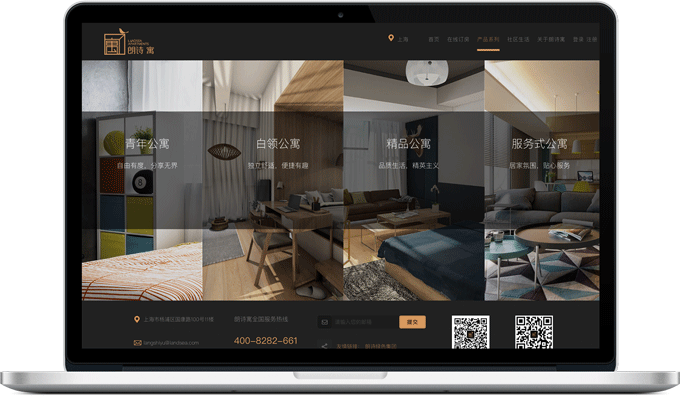 Logic created a WeChat official account for Landsea that walks end users through the step-by-step process of browsing for an apartment, leasing a unit, paying deposits, accessing their lease account information, and paying their monthly rental fees. Users can also use the official account to request basic apartment maintenance services (e.g. repairs) and housekeeping services (a la carte laundry or cleaning services, etc.). This official account is integrated with Landsea’s custom backend system so that the list of apartment availabilities is always accurate and up-to-date. This “lightweight app” makes efficient use of the mobile screen real estate to show important apartment and leasing information without overwhelming users with too much content. The sleek, concise design makes it easy to use the official account’s features without compromising on the beautiful, inspiring images and design that are prevalent on Landsea’s website. Property management: Staff can view a list of all property locations, search for property records, and add/edit/delete/public/share property information. Once a user clicks to view more information on a property record, they can manage each apartment unit (“room”). Room management: Each room has a detailed record of the unit’s location, room type, (number of bathrooms and bedrooms, layout, etc. ), rental fee, duration of the lease, amenities, photos of the unit, etc. 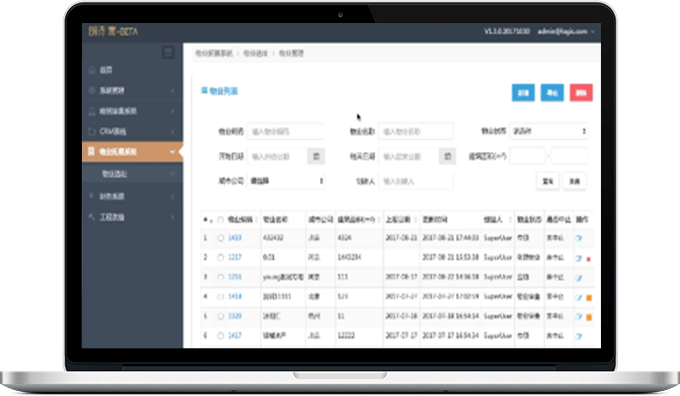 Lease parameter management: Staff can manage how tenants are interacting with the lease, whether through Alipay, WeChat, etc. Contract management: This section manages lease contracts of apartments and rooms that are currently rented. Staff can use filters to quickly find contract records and view contract details. This is integrated with Landsea’s own third-party contract system so that staff don’t have to manually enter the data or record through the backend system. The contract management section can also generate invoices. Booking management: Booking management is used to record and track prospective tenants who want to rent a room and are interested in making an appointment to tour the space. Prospective tenants can book (or lease) an apartment unit via Landsea’s website or WeChat official account. Once the room has been booked, the backend system will automatically generate a PDF lease agreement that end users can sign. This allows staff members to customize the lease terms and conditions for each individual apartment property location or apartment unit as necessary. A signed lease agreement is then moved to the contract management section for ongoing oversight. Apartment Status: This gives staff a top-down apartment building floor plan overview of the status of each apartment unit, from whether it is undergoing reconstruction and/or maintenance to available to lease. Coupon management: Staff can manage available discounts, coupons, or promotions that are currently being run. Ticket management: Staff can manage, view, and resolve maintenance and support tickets from tenants. CRM Module: The CRM module allows staff to manage tenants’ contact information, from tenant’s name, phone number, gender, and address to start and end date of the lease. The CRM module also includes an “information center” where staff can update the website content and pages. Property Expansion Module: The Property Expansion module lets staff manage the information of properties that Landsea Group is interested in purchasing for rental, such as basic property information to property maintenance and inspection. For property maintenance and inspections, there is a built-in approval workflow where staff can propose building and apartment complex maintenance, review, and vote on the maintenance. Properties listed under this module are targeted to be transformed into an apartment-complex-for-rental. Reconstruction Management Module: Apartment reconstruction is important for upgrading older properties and bringing them up to modern building and green technology standards. Reconstruction typically happens when Landsea acquires a new property or an older building is in need of an upgrade. The backend system’s Reconstruction Management module allows staff to monitor and manage these reconstruction tasks to ensure progress is being made. 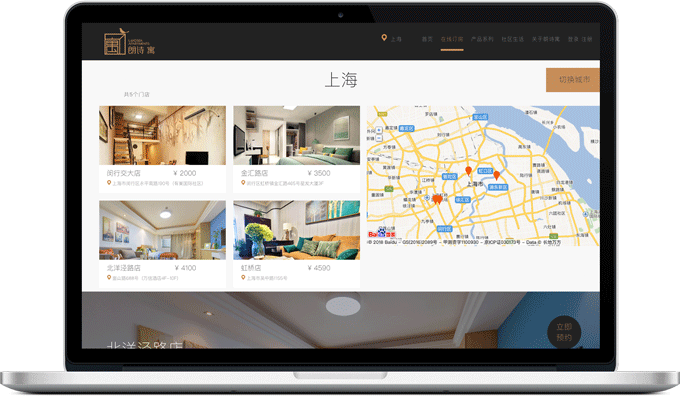 This module is also integrated with the WeChat official account so that end users are aware of the current status of a property. Financial System: The backend system is integrated with Landsea’s own accounting system, so all lease payments are always up to date. 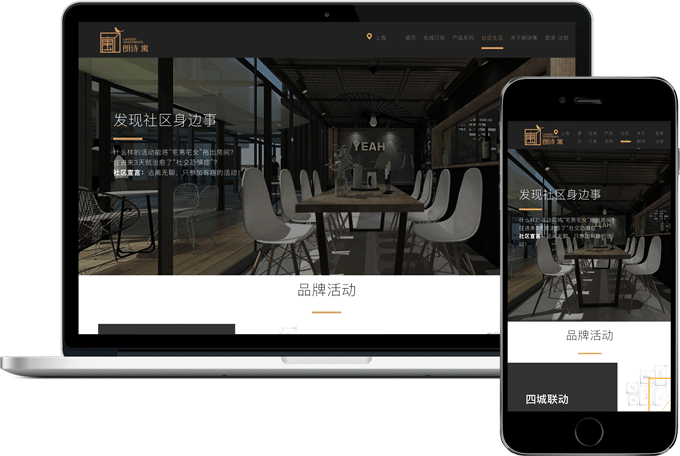 After 6 months of development and thorough testing, Landsea’s three-part solution – a new website, WeChat official account integration, and backend system – were launched with huge success. 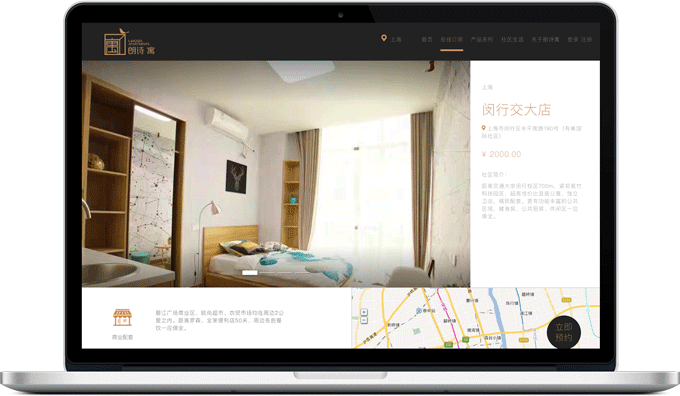 It has already been used by Landsea Apartments to manage 8000+ apartments in 8 different cities throughout China.